A Vietnamese man has been arrested for allegedly trying to smuggle a rare and expensive fish into Australia in a bag hanging around his neck. 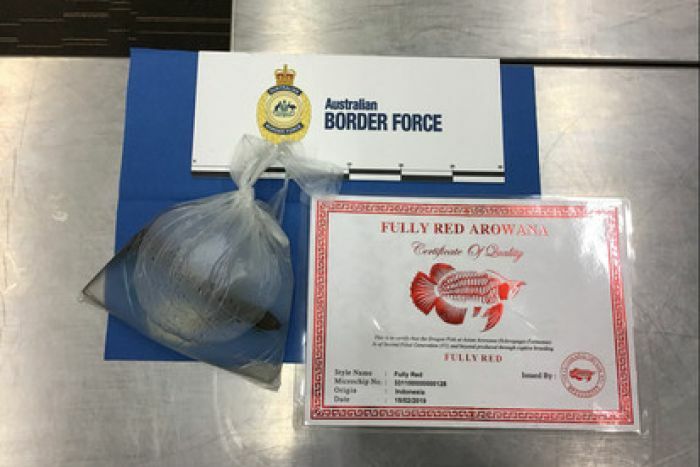 In a statement, the Australian Border Force (ABF) said the 34-year-old man, who was on a flight from Malaysia, was arrested at Adelaide Airport last Tuesday while allegedly trying to import a fully red Asian arowana fish into Australia. “The fish was referred to the Department of Agriculture and Water Resources for identification and to assess the biosecurity risk,” they said. “It was determined to be an endangered fully red Asian arowana, the trade of which is controlled under the Convention on International Trade of Endangered Species, to which Australia is a signatory. The fish and the bag of water were discovered in a frisk search. The man was then arrested and is expected to appear in the Adelaide Magistrates Court on May 15. Asian arowana are also known as dragon fish. ABF Chief Superintendent Brett Liebich said the agency would do everything in its power to disrupt and deter the illegal trade of animals. “The ABF is committed to stopping the trade in rare animals and protecting our delicate natural wildlife from the potentially devastating impact of foreign diseases and predators,” Mr Liebich said. The maximum penalty for wildlife trade offences for individuals is 10 years’ imprisonment and a fine of up to $210,000.